Reef tank aquariums can be expensive to setup and difficult to maintain. Nano reef aquariums are a great lower cost solution, allowing you to keep corals and anemones in smaller tanks. Nano reefs have become popular the last decade and the technology available has rapidly improved and become more affordable. The best nano reef tanks won’t break the bank and will have the best coral keeping tech available. There’s something eye catching about a nano reef filled with coral of various colors, shapes and sizes. They’re fascinating and relaxing to watch. But if you’re considering getting a nano reef aquarium, there are a few things to consider first. When housing coral you will generally want to buy a filter, a protein skimmer, and a circulating pump or wave maker. Coral need regular water flow and movement in order to get their nutrients, it is important to avoid having a stagnant tank. Although not essential, setting up an eco-system in addition to your coral will provide you with great some great benefits. This would involve other inhabitants like reef safe-fish, cleaning crew (crustaceans and sea-stars) and seaweed (or macro-algae). Cleaners will reduce detriment and macro algae in a refugium can help lower nitrates. Low nitrates are necessary for long term coral health. Along with your reef inhabitants you will need to find lighting to help your coral grow. This is dependent on the type of coral you wish to keep. For most species, the all in one solutions (AIO) below will have sufficient lighting. It is important to understand your end goal requirements before purchasing your nano reef tank. Ask yourself the important questions. What type of coral do you wish to keep? Do I want fish? Do I want a sump? 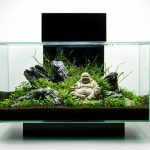 Do I have space for a refugium? In order to help you find the perfect reef tank, we’ve put together a list of the top 10 tanks for 2019 specifically made for coral enthusiasts like you. Keep reading to see a list of our favourite reef tanks along with information about their price, quality, and features. Which size and price is right for me? Should I focus on the warranty? Our 2019 Choice for Beginners? This is one of our favourite tanks of 2019. 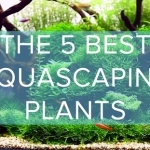 It is slightly more expensive than other all-in-one aquariums on this list but it delivers great value. The rimless design of this marine nano gives it an edge over the competition. In our opinion, rimless is essential in 2019 (It’s just too beautiful!). A perfect addition to those who want clownfish on the kitchen counter or in their bedroom. One of the main reasons we have listed this tank as #1 is its customisability. For such a small aquarium, Innovative Marine has done an excellent job in allowing the user to create the tank of their dreams. The filter sock can be subbed out for 3 levels of bio-media. 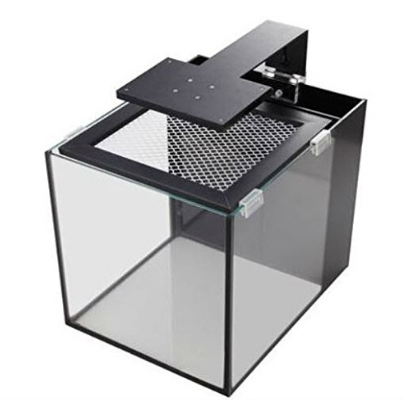 There is a second chamber that can either be used as a refugium or fits a skimmer. The final chamber allows enough room for your heater and ATO to keep all the wires covered. The aquarium is large at 20 gallons but not too large to be placed on any flat surface or sturdy furniture. A great size for the beginner or experienced aquarist. Incredible customisability options. You can easily turn the central chamber into a refugium or add in a skimmer. These are beneficial to the health of your corals. Open top is not appropriate for all fish. Wrasse’s are a good example of species that need mesh or closed top. This five gallon nano reef tank is made out of high quality, clear glass which offers a crisp and full view of your aquarium. The tank’s dimension are 8.3 x 21.3 x 12.5 inches and it comes with a 3 stage filter that is discreetly hidden on the edge of the tank in a honey comb compartment. This kit also comes with a 11000K high-output LED light which offers the perfect amount of light to help your coral grow. However, we would not recommend using this light to grow SPS. Fluval is one of the largest aquarium brands, they generally make great products and stand by their warranty. At this price it’s a great starter nano reef aquarium. 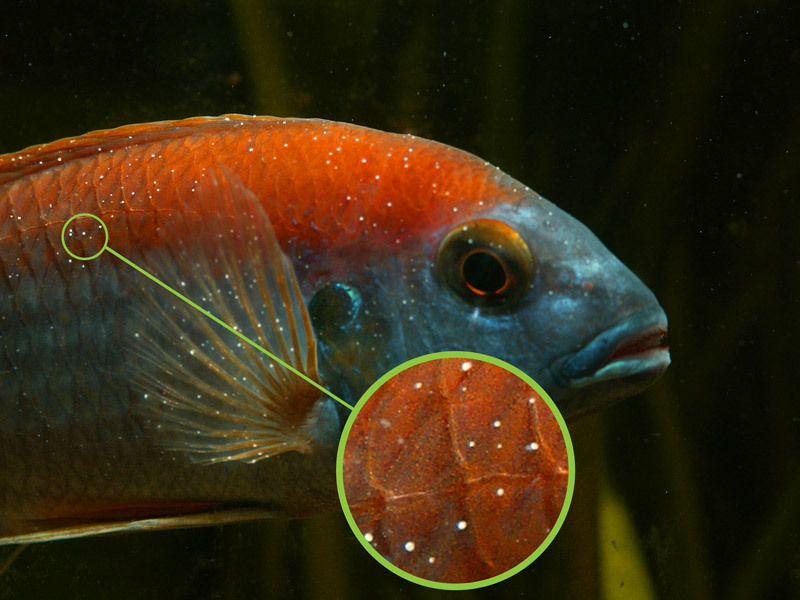 The aquarium comes with a light and filter, so you do not have purchase these separately. The LED light has day and night time settings. The filter cleans your water through a chemical, biological, and mechanical filtration system. This is a great price and starting point for any marine enthusiast. The filter has been reportedly noisy by a number of reviewers. A water pump is not included in this kit and will need to be purchased. SPS would not be recommended with this setup. The Coralife nano reef tank is somewhat larger than the previous one on our list. It’s dimension are 20.2 x 21.9 x 21.5 inches. It has a smooth, modern design with a sleek black cover that opens for feeding and maitenance. The lid has an integrated LED light with day and night time settings as well as sunrise and sunset features. The Coralife even comes with a pump and a multi stage filtration system that sits discreetly in a separate chamber in the back of the aquarium. The larger volume on this nano reef helps to keep the water parameters stable. Smaller nano reef aquariums are often subject to swings in pH, calcium, magnesium and potassium which can be detrimental to coral health. It is always recommended to purchase the largest aquarium you can afford that will stay within budget. This is a decent sized nano reef tank. A pump and filter are included in the aquarium. The LED lights automatically imitate the natural day/night time cycles of the sun. This is a great feature and will ensure viewing through all times of the day. 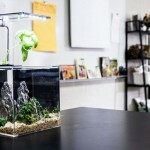 Possibility to grow SPS in this aquarium with sufficient flow. Doesn’t include a skimmer but has the real estate to DIY install one. A skimmer is very important if you’re going to keep corals. Alternatively, 3-4 water changes a week would be required. The Fluval 10531A1 nano reef is a sleek and modern tank with aluminum casing. Its dimensions are 22 x 11.5 x 15 in and it can hold up to 13.5 gallons of water. It comes with an internal filter that cleans your water through a three stage filtration process as well as a 132 GPH submersible pump (both tucked away discreetly in a honeycomb compartment.) An LED canopy hangs over the tank and it produces 14,000 K lighting with day and night time settings. Once again, Fluval is a leading company that makes solid products. For $50 more than the Evo V this aquarium holds 3x the amount of water. The added volume will improve stability in the aquarium. Excellent price to quality ratio. 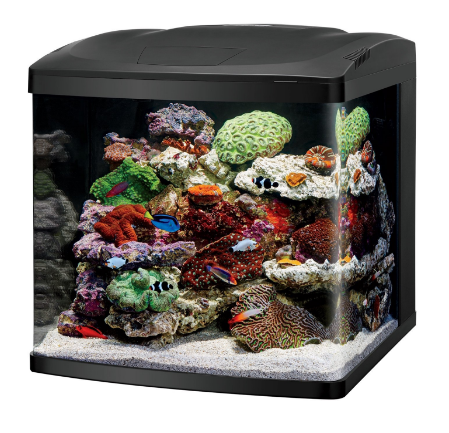 This is an amazing deal on a 13 gallon nano reef that is ready-to-run. Comes with a filter, pump and a light. The filters cleans your water through a chemical, biological, and mechanical process. It doesn’t come with a protein skimmer. The LED light is somewhat basic and it doesn’t have timed settings or programming features. You may need to upgrade the light to keep some LPS and SPS. This aquarium is probably not considered a nano reef. But we love the dimensions and wanted to include it anyway. The SCA is 50 gallons and measures 24x24x20 inches. These dimensions are great for keeping a wide array of coral. Corals that require more light can be kept toward the top of the aquarium and vice versa. 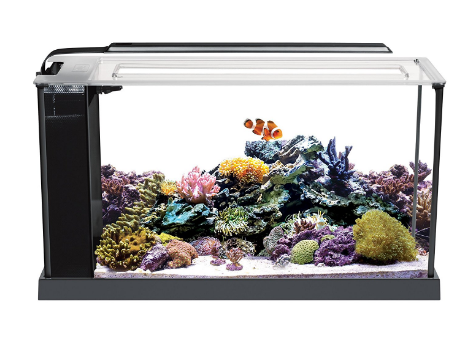 Its one of the best nano reef tanks due to its flexibility but it makes up for it with its high price tag. 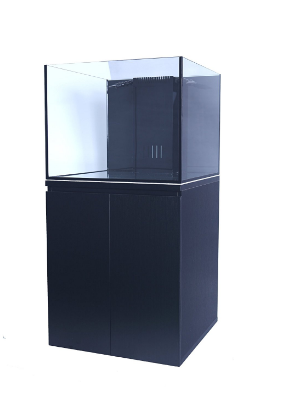 The SCA nano reef comes with a cabinet stand measuring 24x24x31 inches, a skimmer, sump, a return pump, and various pipes, tubing, and filter media. The price definitely reflects these inclusions. It comes with almost all the required accessories and a cabinet stand. The glass aquarium comes with a 3 year warranty. The accessories come with a 1 year warranty. It doesn’t come with lights. Remember that these can be the most expensive accessory, especially for a tank of this depth. It can be a bit challenging to set up compared to the other all-in-one nano reefs. The price is much higher than the other listings. However, this is due to the size of the aquarium. It’s a much larger tank and is all-inclusive for a reef setup. 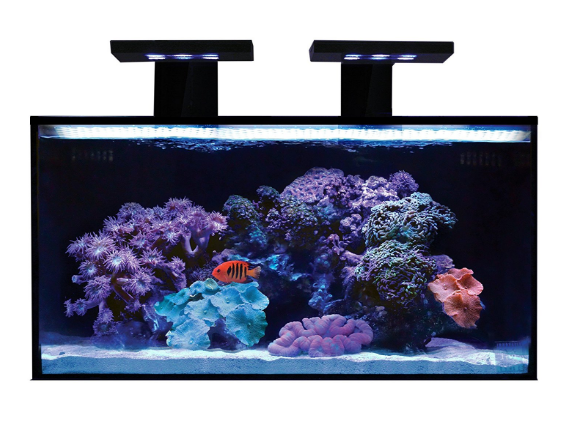 The Red Sea Max Nano is another kit that comes with a cabinet stand** and various accessories like a rear sump, a protein skimmer, and LED lights. The tank measures 21.4 x 21 x 22 inches and holds up to 20 gallons. Although slightly larger than other nano reef aquariums, the added volume will help to improve the water stability. The 2019 model of this aquarium has been upgraded to include remote WIFI controls and improved high output LED lighting. In the rear sump of the tank it is possible to include a surface skimmer, a protein skimmer a circulation pump, a pump outlet nozzle, a heater, and a cooling fan. This pump comes with everything you need to set up your own coral tank. The surface skimmer is a welcome addition. Surface foam and scum is common in reef aquariums. **Cabinet is sometimes included, check your listing. It comes with everything you need to set up your tank. This aquarium is ready to house marine corals and fish. Made from high quality materials and includes quality components. This is an extremely high quality product from a reputable brand. You can count on this to last for years to come. Higher volume that aids in water parameter stability. A popular product that is often sold out on major online stores like Amazon. It’s very expensive compared to the other nano models. Setting up the pump and skimmer can be difficult and time consuming if you don’t have previous experience doing this. Innovative Marine is a brand that makes it onto this list multiple times. Why? It is a great brand that seeks to create value for its customers. They are actively trying to bring reef keeping to the average consumer. This model measures 12 x 15 x 13 inches and holds up to 10 gallons. This kit is excellent for beginners since it comes with an LED lighting system with several settings, a level mat, a screen mesh top, a three stage filter and a 92 GPH pump. This tank is minimalistic yet modern and visually appealing. You do not need to buy any extra accessories to set up the tank. The glass is durable and made out of high quality material. Excellent price to quality ratio. The LED lights don’t have a switch so they need to be unplugged in order to turn them off. If you want extra purification, you may need to buy a protein skimmer separately. 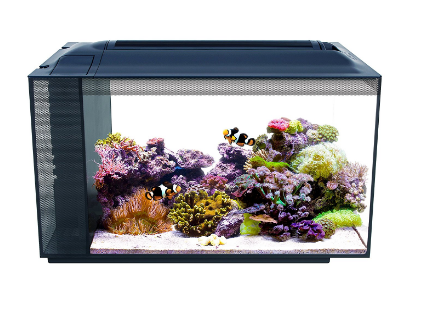 The Marina LED nano reef also comes with a clip on filter, filter cartridges, natural daylight effect LED lights, water conditioner, biological supplements, a fish net, and an aquarium fish guide. For $70 in 2018 you can’t really beat the value of this product. 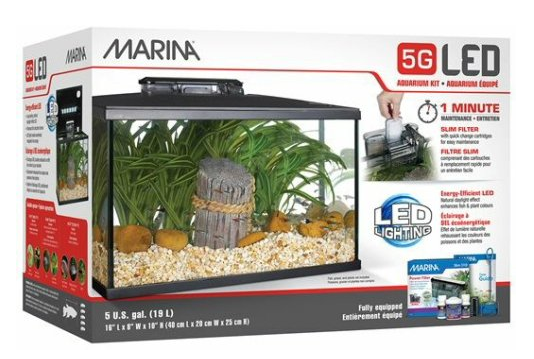 If you’re nervous about getting started in the hobby, the Marina LED would be a great first aquarium. From here you can graduate to a larger nano reef and include LPS and SPS corals. The tank comes with most of the necessary accessories that you will need. The filter is reportedly very quiet. Excellent price to quality ratio. You are purchasing a full setup for just $80. It can be used as a coral tank, betta or regular freshwater tropical tank. There have been customer complaints that the LED light can be too strong for certain fish. Not a great solution for keeping corals. Without a skimmer and having such a low volume means water quality could fluccuate. 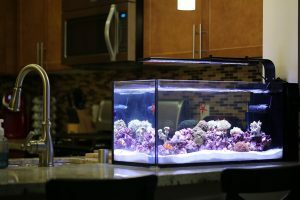 The JBJ nano reef tank holds up to 6 gallons and measures 16 x 16 x 11.5 inches. It’s made out of acrylic plastic and it comes with a filter that works with an advanced 3 stage filtration system. It also comes with cooling fans, manual day and night lighting, and a plastic cover and lid. It has a simple, yet practical layout. Perfect for someone’s first marine tank. Offers a panoramic view of the fish. It can be used as a nano reef tank, but is also a great choice for a fresh and saltwater fish nano. Because it’s made out of acrylic materials, it is less scratch proof than a glass aquarium. It’s a bit expensive, taking into account the price to value ratio. Glass is always preferable to acrylic and at this price it’s disappointing that its not included. 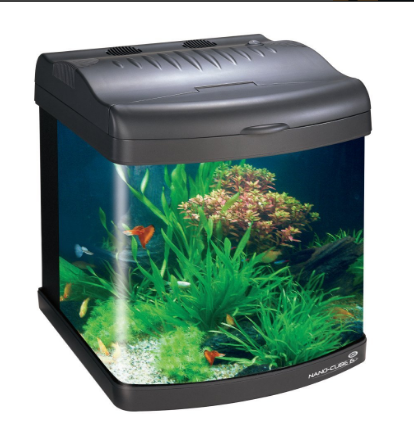 This 20 gallon unit is best for those who are looking for a medium sized tank. It’s dimensions are 24 x 15 x 13 inches and it comes with two LED lights which hang above the tank and have day and night time settings. This tank also comes with a 3 stage filter and an adjustable water pump to help nutrients reach your coral on a regular basis. The glass is very durable and high quality. The LED lights are specially designed to help coral grow. It comes with a 1 year warranty. The pump and filter have been reported to be somewhat noisy. 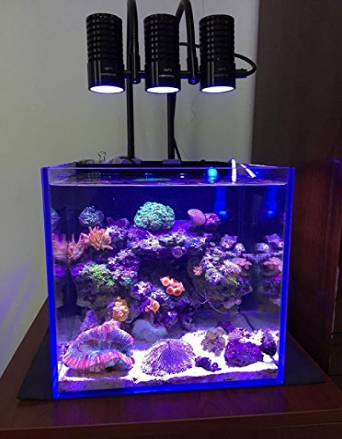 The Marine LED nano reef lighting is best for those who want to house their coral in a small environment. 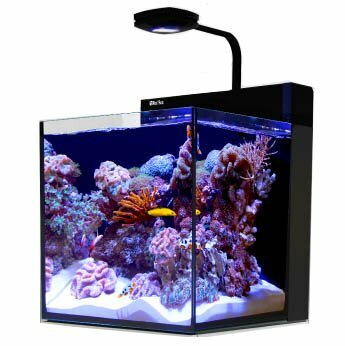 Built for cubes and rectangular aquariums it will give you an excellent view of your aquarium (just remember low-iron glass gives you improved clarity. This nano system comes with three high powered LED lights with a controller that lets you modify the light to a number of different settings. This nano lighting system takes up very little room and in can be easily installed anywhere in your home. The lights have multiple functions and includes a remote control. Built specifically for those keeping corals in mind. This light was made for lovers of LPS and SPS. Pump, filter, and lid will need to be bought separately. However, this allows for a high level of customisation. Too focussed to be used on longer aquariums. Your coral choices will be limited to smaller aquariums or directly under the lights. The tanks we’ve listed here all range in price, size, and quality. We feel that there is something for everyone on this list, but if you need any further guidance, make sure to let us know below. Before purchasing a tank, make sure to go over a few things in order to make the most out of your purchase. 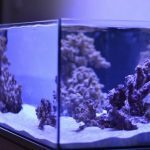 First off, decide what size is best for you since reef aquariums can range in sizes of 5 to 30 gallons (despite having the word “nano” in their name.) You also want to pay attention to whether the tank is made out of acrylic or glass. Although acrylic tanks are more durable, they don’t always look the best and they tend to scratch very easily. If your tank comes with accessories, especially LED lights, pumps, and filters, this might hike up the price. 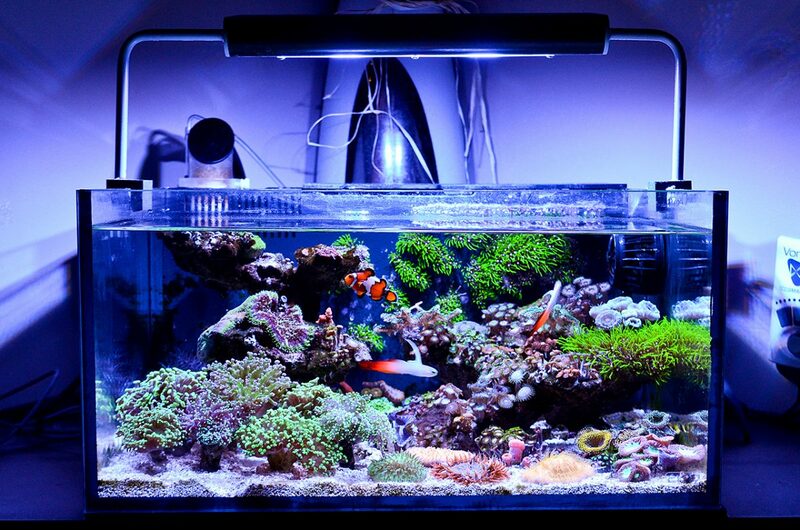 In these cases, you may end up saving money buying a reef kit rather than purchasing all the accessories separately. An additional pump or wave maker is recommended, especially if you are planning on keeping SPS or hard corals. As we previously mentioned, moving water allows coral to get its nutrients so if the tank your purchasing already comes with a pumps, you’ve made a very wise purchase. Products with a warranty are always a plus, but in the end, you want to buy a reef tank that is made out of high quality materials. Your inhabitants in the tank will likely be more expensive than the glass box itself! A good cautionary note to keep in mind. Coral can live for a very long time, so you want to find something that will be able to house it for the long term. 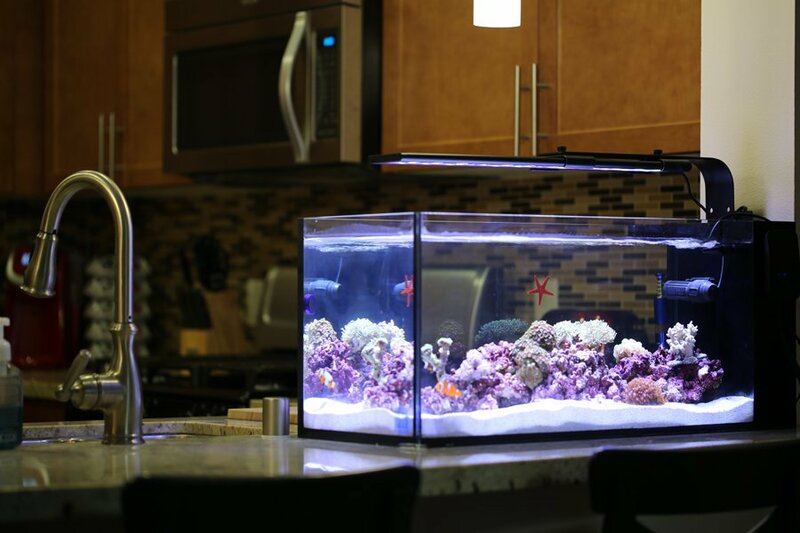 Reef tanks are a captivating and beautiful addition to one’s home. They can even help reduce stress after a long day’s work and they’re known give off an excellent feeling of tranquility to your living room, office, or bedroom. Whether you decide to have a simple coral tank or a coral tank with fish and plants added on, what’s important is that you make the tank your own. Out of all the products listed, our personal favourite has got to be The Coralife Fish Tank LED BioCube Aquarium Starter Kit. This was our favorite choice for 2018 and continues to be our favorite choice for 2019. If you’re a pure beginner and don’t know where to start, this is the perfect product for you. Not only is the kit within a reasonable price range, but it comes with a pump and an LED light with day and night time settings. It has received various positive reviews on Amazon and it’s a very visually appealing tank that will give any room in your home a very pleasant and relaxing feel. If you already own some of the reef tanks mentioned on our list, what our your personal thoughts on the product? We’d love to hear from you in our comments’ section below! 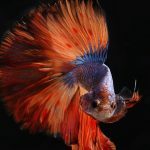 Aquarium Info is a participant in the Amazon Services LLC Associates Program, an affiliate advertising program designed to provide a means for sites to earn advertising fees by advertising and linking to Amazon.com. 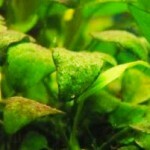 The Best Ways to Remove Brown Algae from the Aquarium.